White Lake proved to be typical of the 2012 season: a lake loaded with potential, but failed to show it. On a typical Michiana body of water, 13 double digit weights, with an average weight of 9.62 pounds, would be dynamic. But this is not a typical Michiana lake and more was expected. It seemed all season that the bite stiffened when R & B showed up, but White Lake complemented this with atrocious weather. Regardless, the R & B competitors proved again why this circuit is the premier circuit in Michiana. 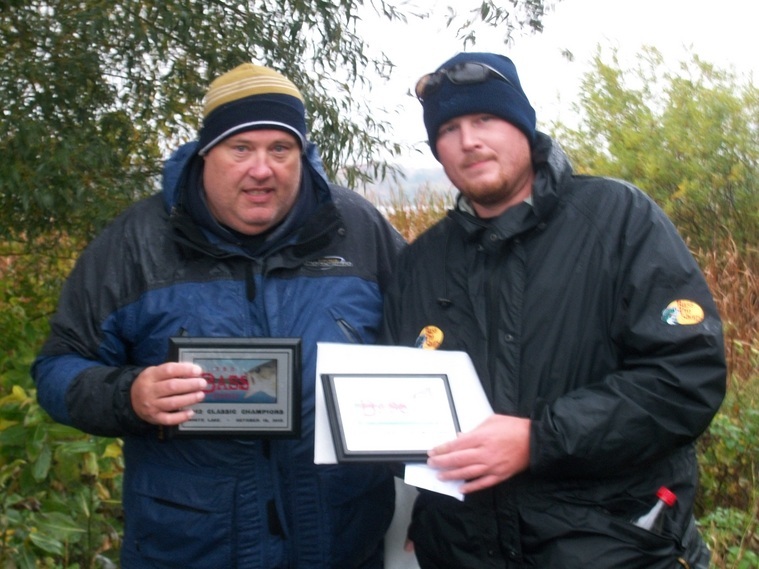 Despite winds gusting to 30 mph, heavy rain, and temperatures reaching just the low 50s, the 25 teams still brought 78 bass to the scales weighing nearly 200 pounds. Anglers were rewarded with a payback over $5,200 (to compliment the $17,000 paid throughout the season). Congratulations to all who qualified and enjoy the season’s final results below. 1st Place: A $70 dollar investment in May turned into an $1100 profit for the father and son team of John and Ryan Law in October. You will not find any banks who can match that deal. 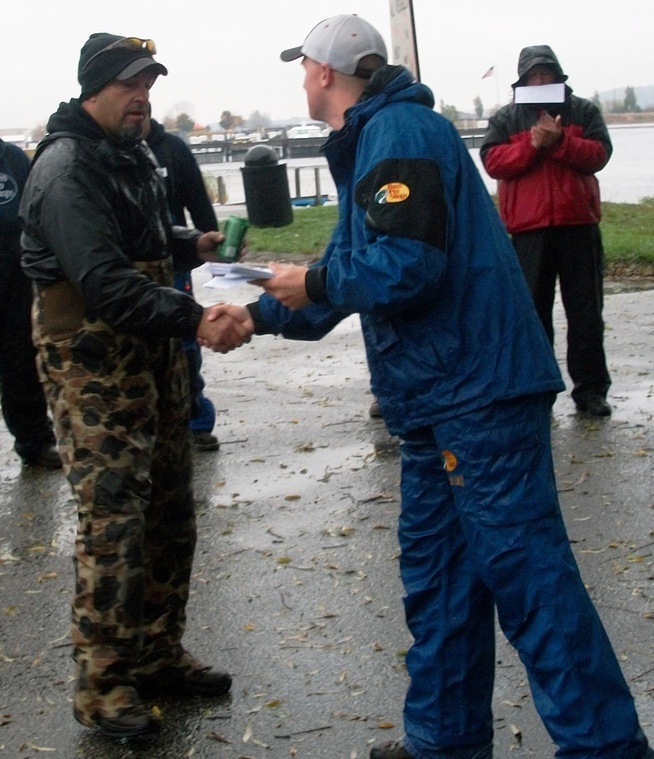 The champions had conflicts with the May 20 event on Barbee Lake, but insured their qualification to the classic by still paying the entry fee. Although they received 10 participation points, this was a large part of their boat number for the classic: with the worst finish of the teams that qualified they were the call boat. But let that be a lesson. 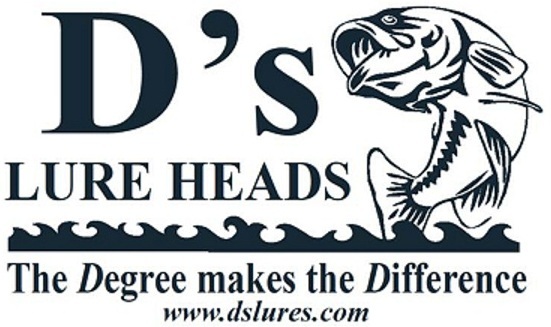 There could be no better lesson learned for all anglers than the lessons learned by the Law’s. Everyday is a new day, and every day brings new opportunities to succeed and catch big fish. A look at the season would reveal the Law’s struggled. But apparently the fish on White Lake were not affected by their final placement in the Standings. Actually, they nearly left for home Friday night. John recalls, “Practice on Friday was worthless. We caught a couple of dinks and one keeper; and we knew the weather was going to be horrible. We were very close to leaving for home.” It is amazing how 24 hours can change things. Lesson: never stop, and never stop. Beyond growing doubt, Friday told them what to avoid. On Saturday John and Ryan went on to catch 20 keepers from one area roughly 200 yards long. 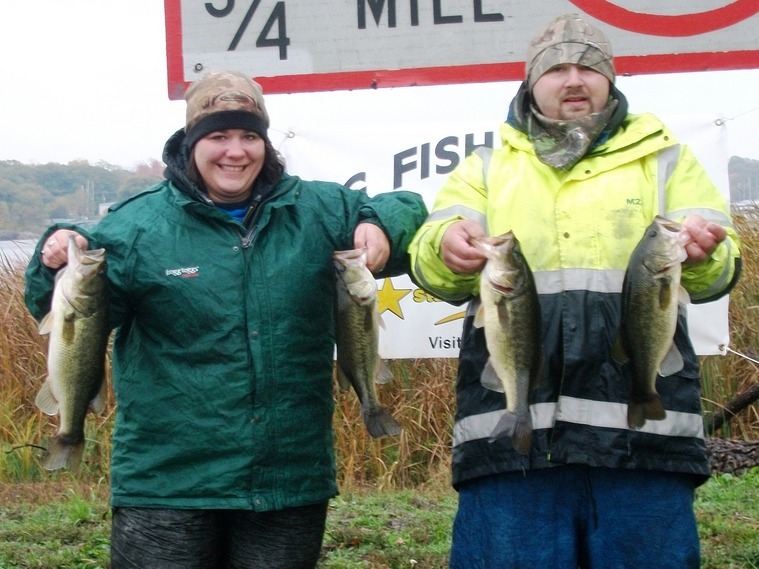 These fish came from an area they had success at the previous year at a club tournament as practice showed them no new areas worthy of their time. “No doubt in my mind, the weather got those fish going,” admits the elder Law. It was a steady bite as they also caught 20 nonkeepers. It only took 75 minutes to boat a limit. A five inch senko, rigged wacky style, produced all of their fish. They threw several different colors and they all worked. The 15.45 pound limit won them $1166. Not a bad investment. 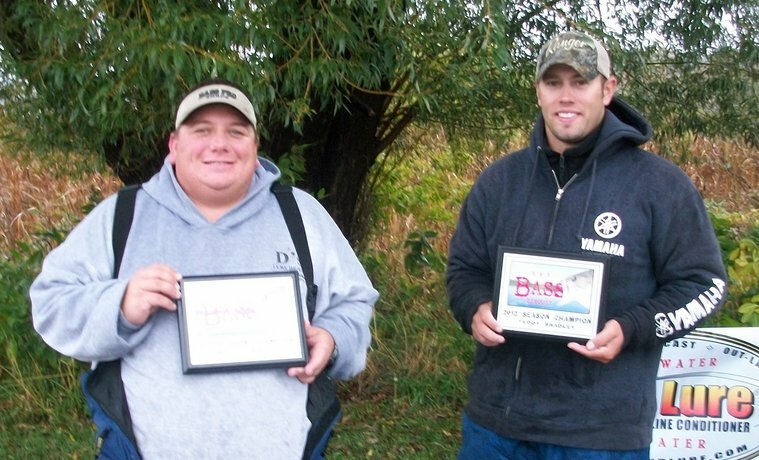 2nd Place: The team of Aaron Krider and Bob Bruick had to work especially hard to qualify for the classic after missing the Barbee Lake event, but were rewarded for their efforts with $776. However, when showing up Friday night, they thought “donating” their money was a bigger possibility. morning dawned an entirely different scenario. “When we woke up to rain ‘Team Bruick’ went into effect,” admitted Krider. Under Bruick’s guidance, the team tied on War Eagle spinnerbaits: Krider, a ½ ounce purple shad and Bruick a white 3/16 ounce and committed themselves to them. Not a bad commitment either; they went on to catch 20 keepers and end with a 14.24 pound limit. They focused in water four feet and shallower employing a stop and go retrieve as the bites were coming on the pause. More specifically, the fish were biting most often in bald spots amongst the weeds. This area was an inside cut off a flat. They soaked the area for all it was worth until the last two hours they made a big move. “We moved to a small area we saw some real giants in practice but never got to bite. We culled all five of our fish here in the last two hours,” admitted Krider. 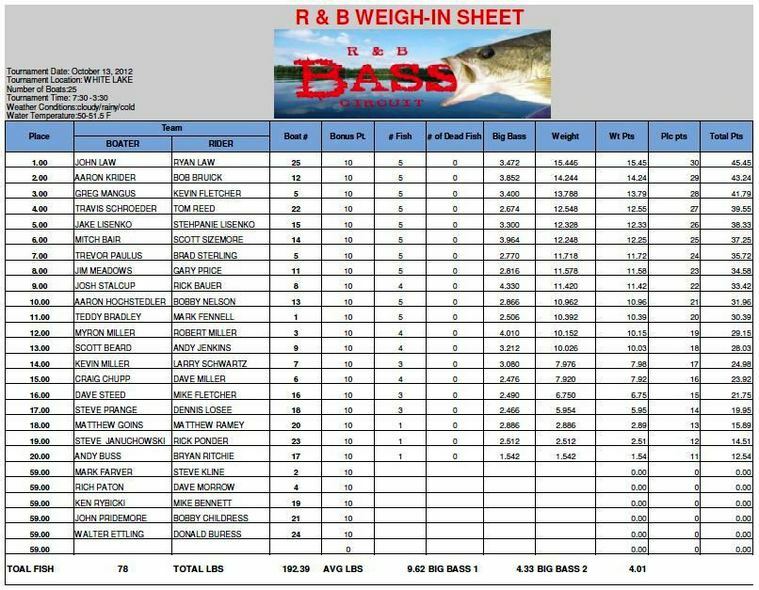 3rd Place: A good bite Friday on crankbaits and swimbaits for Greg Mangus and Kevin Fletcher fizzled on Saturday, but the most revered team in Michiana reacted by switching to Mango jigs and landed 20 keepers from three spots. “We focused between 5-8 feet of water on the outside edge of ‘bald’ spots,” admitted Fletcher. He elaborated further that it was critical to be in the right spot, “Each of our three areas had a ‘sweet’ spot.” The bites came when they popped the jigs loose from weeds. After securing a limit in just 60 minutes, they were able to focus on improving their catch the remainder of the day. Their best five fish weighed 13.79 pounds and awarded them $572. 4th Place: Lake Wawasee winners Travis Schroeder and Tom Reed could not believe their ears at Tippecanoe Lake when they heard the announcement of White Lake. “We have spent a week up there the first week of October for the past 15 years,” revealed Schroeder. This year they spent the entire week of October 1-5 exploring the waters they were already intimately familiar with. What they found this year were some smallmouth haunts. “We found some eelgrass that the smallies came up to feed on in the morning. We also came up with a bait they really liked,” admitted Schroeder. That bait was an XCalibur Eeratic Shad in the Deadly Shad color scheme. 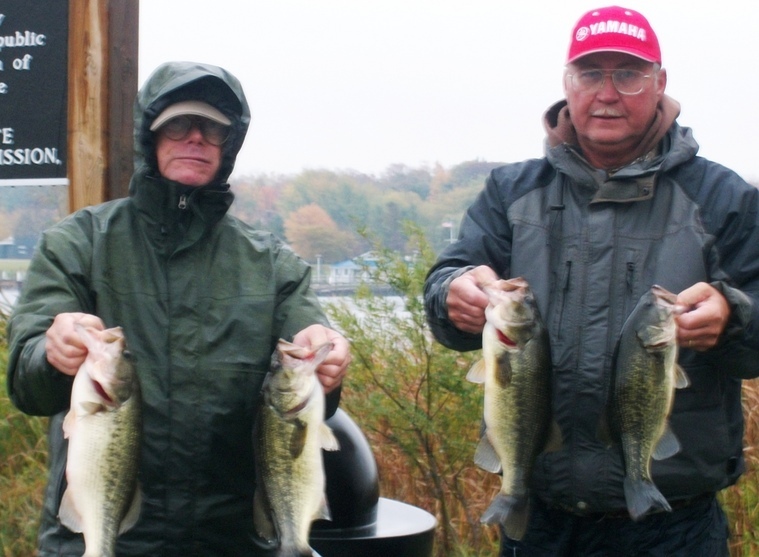 “We threw other jerkbaits, but this one out produced all others,” added Schroeder. Still, their best five fish still weighed 12.55 pounds and won them $450. 5th Place: The only husband and wife team to join R & B, Jake and Stephanie Lisenko, have gotten our attentio,n with their raw skill. Raw, because this also marks the first year they have fished competitively. In their first year they logged a 15th place finish overall and two top 5 finishes. The future looks bright for them. longer and returned to her vehicle where she rested. Jake then went on to out fish nearly the whole field by himself. “I was fishing a trough nearly 15 feet deep that rose up to 3 foot on each side,” Jake revealed. “The deep water produced three keepers early, and when that fizzled, I went up shallow and caught 12 keepers in 40 minutes.” Later, he pulled out another five keepers from the trough. Perhaps the most amazing aspect of his assault, was the fact he never caught a sub-legal bass amongst the near 20 keepers her boated. 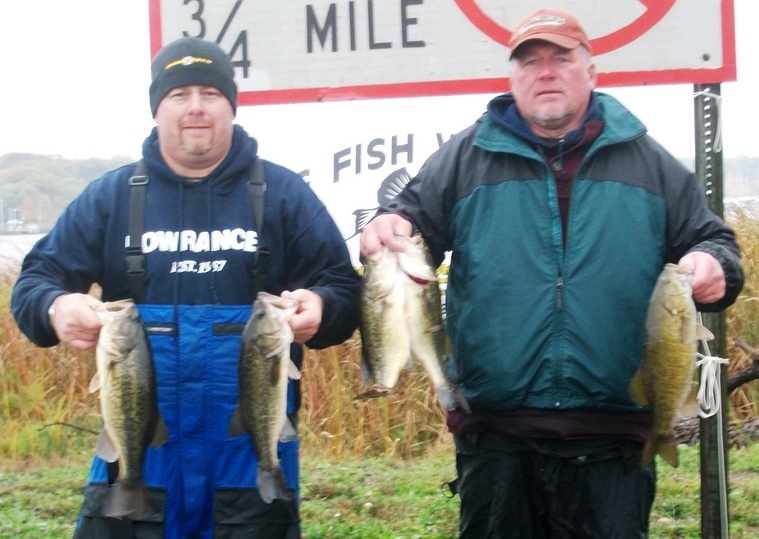 Their best five weighed 12.33 pounds and won them $368. 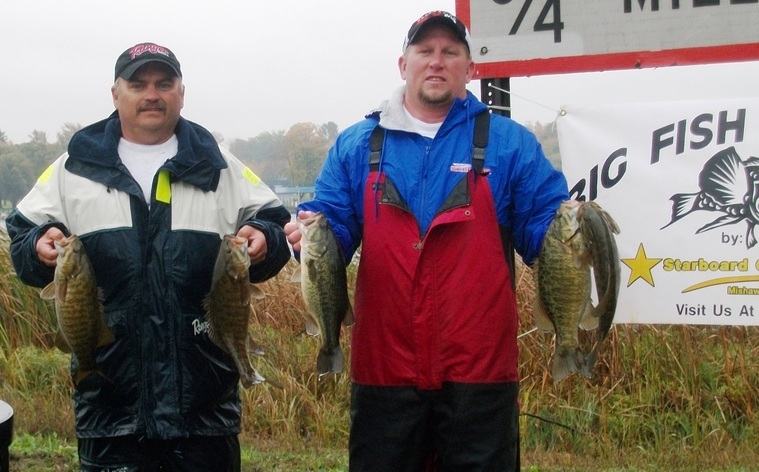 6th Place: Mitch Bair and Scott Sizemore (left) put together a 12.25 pound limit to win $268. They also won the C Flash big bass award, giving them an additional $125. 7th Place: Barbee Lake winners, Trevor Paulus and Brad Sterling (right) wanted to run to Muskegon Lake, but the six-foot waves kept them on White Lake. Regardless, they still managed an 11.72 pound limit and won $244. 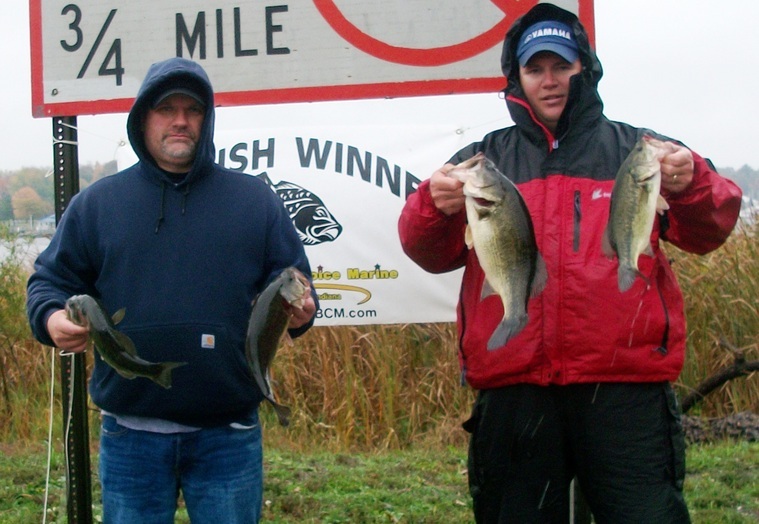 8th Place:Jim Meadows and Gary Price (left) caught 19 keepers to bring an 11.42 pound limit and to the scales and take home $224. 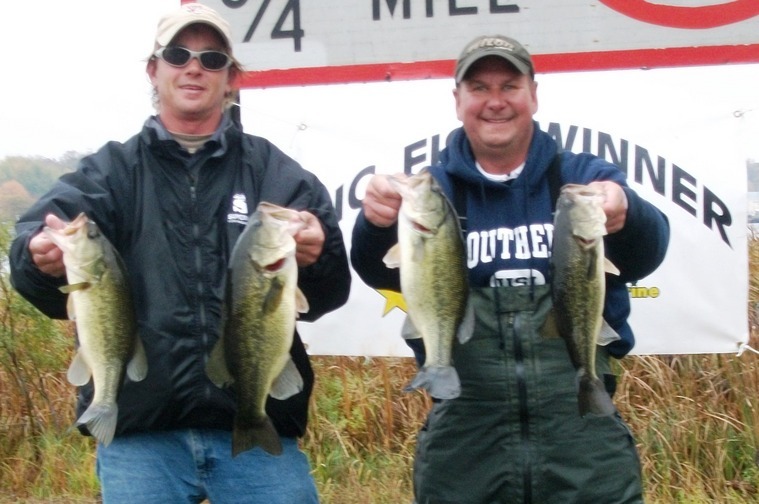 Josh Stalcup and Rick Bauer brought in four fish, including the biggest bass of the tournament, a 4.33 pound largemouth, to win the best consolation prize in Michiana. The D's Award was worth well over $100. They also won $350 for the big fish. 2012 Points Champions: Teddy Bradley and Mark Fennell were awarded their plaques and $400 at the conclusion of the weigh-in. The team has proven themselves as a premier team in all of Michiana. To learn their keys of success in 2012, read Back to Back. Congratulations to Steve Januchowski for winning the t-shirt draw. Steve took home $159 for simply purchasing an R & B shirt. Now the women are staring and his wallet is fat.